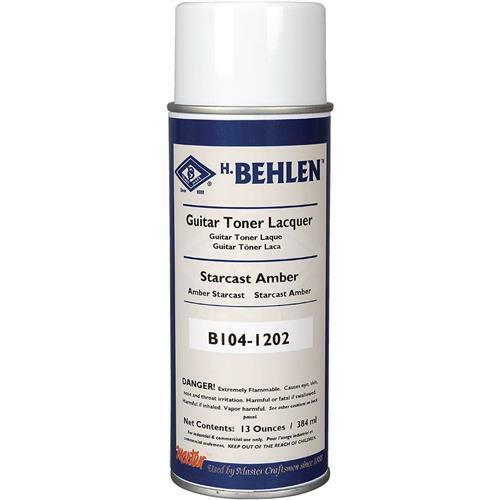 Guitar Toner Lacquer-Starcast Amber 13 oz. 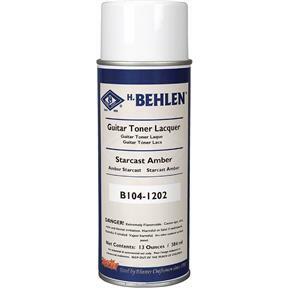 Behlen B104-1202 - Guitar Toner Lacquer-Starcast Amber 13 oz. Guitar Toner Aerosols are used to add controllable, even color to the guitar. Made from fade resistant dyes, they apply transparent color so the beauty of the wood shows through, yet they are strong enough that several coats will create the dark sunburst effect that is so popular on guitars. Starcast Amber applies the basic light tone colors of the guitar. Encore Brown (T20846)is used to tone the body sides of acoustic guitars, which are typically darker than the soundboard. The Encore Brown is also used to create a sunburst effect around the edge of the body of a guitar, whether acoustic or solid bodied. Often Encore Brown is used at the edge and then Starcast Amber is sprayed over the Encore Brown, but in a wider pattern, to create a two-toned starburst. Typically, Vinyl Sealer is applied before the Guitar Toners and Stringed Instrument Lacquer is applied after the Guitar Toners to create a professional finish. With just a little practice, a first time luthier can apply a professional looking finish. 13 fl. oz.